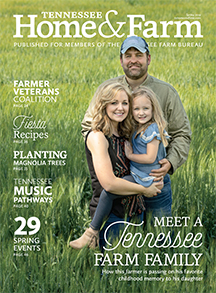 After seeing inspiring photos from another farm-to-table dinner in Tennessee, Cookeville farmer Randy Dodson and Rodney Laulo of the nonprofit SeedFork of the Highlands partnered to do the same. 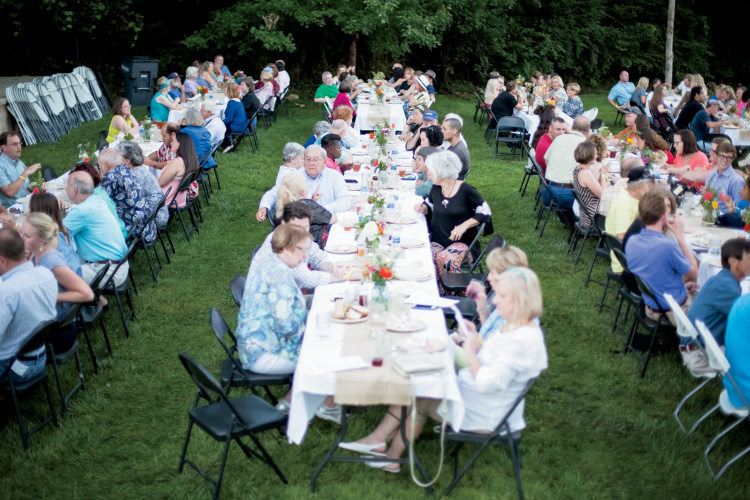 Ellen Wolfe, a retired teacher who volunteers with SeedFork, helped to organize the first Celebration of Local Foods, a four-course meal for 155 in Dogwood Park, hosted by SeedFork and Downtown Green Market farmers market. 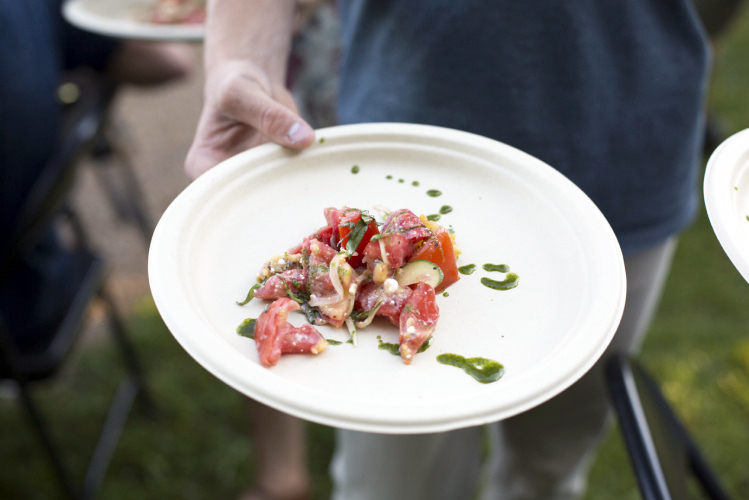 Nestled in the park’s theater-style “bowl,” guests listened to live music and savored four courses concocted by four different chefs who coordinated the salad, appetizer, entrée and dessert, all made with food provided by 10 local farmers. 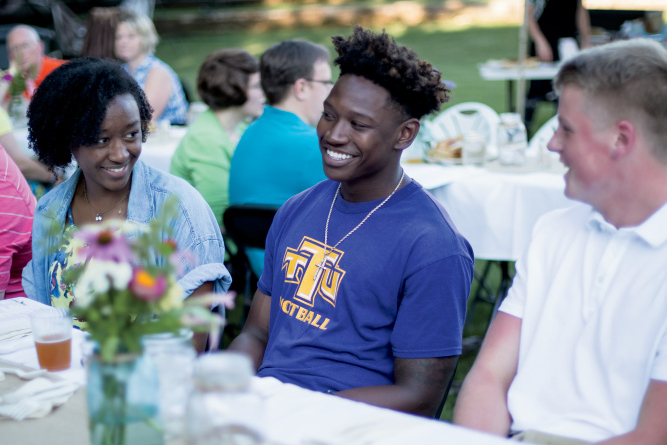 Patrons got a chance to dine with people they didn’t know while learning about the importance of buying fruits, vegetables and meats grown in their own backyards. 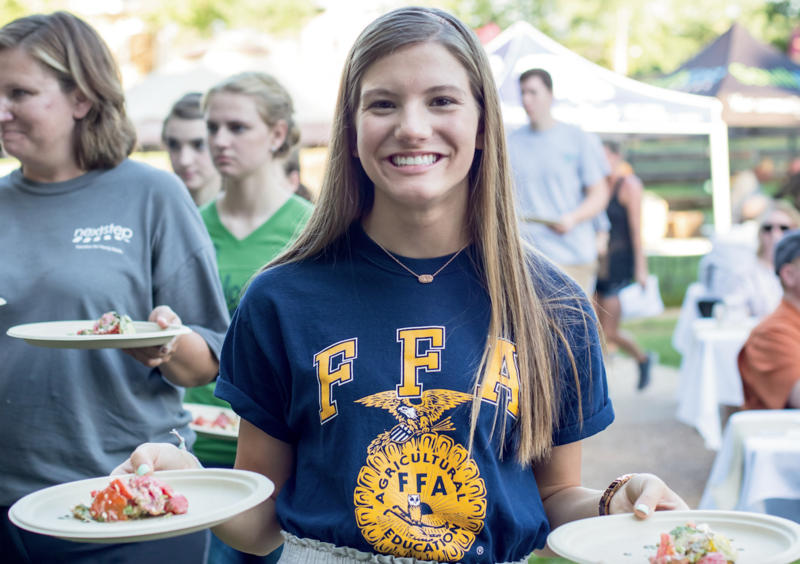 The event raised $8,000 for SeedFork of the Highlands to buy a flatbed trailer, local 4-H and FFA clubs, and Teens Need Training, which provides after-school and summer programs for youth living in and near public housing developments. 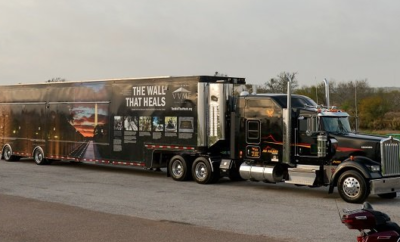 Four manufacturing and technology engineering seniors from Tennessee Tech University are building a mobile refrigerator unit to distribute fresh, surplus produce from the farmers markets and gardens to food pantries and individuals in need. 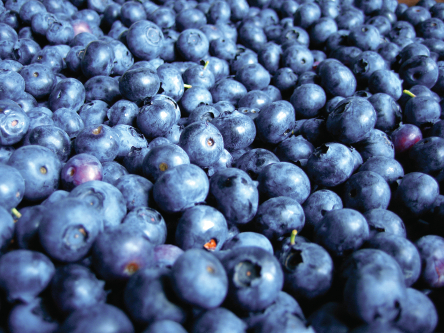 This year, Celebration of Local Foods will benefit the new Putnam County Food Council, which promotes healthy eating, and Helping Hands, an agency that assists at-risk populations. Organizers expect 250 attendees and are adding a “food festival” element with educational booths. The success has also triggered talk of a “food hub,” a shared building where chefs, farmers, cooking school operators and educators could form partnerships to help the community. Jonesborough farmers market director Karen Childress had already read about Outstanding in the Field, a national company that arranges outdoor community dinners at farms, urban gardens and other sites. And she’d marveled at the gorgeous photos of the long, shared tables laden with gourmet dishes. 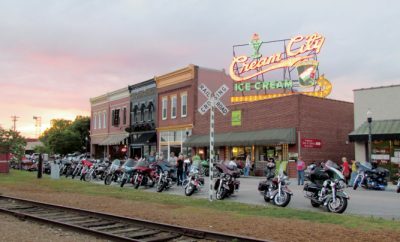 But when Chef Alex Bomba, his wife Breelyn, and her parents Herman and Beverly Jenkins, who own Main Street Café and Catering, approached the market about hosting a similar soiree with locally sourced food in downtown Jonesborough, Childress’ reaction was, “There’s no way. How on earth? That’s such a big production.” Nevertheless, Childress couldn’t say no when the Bombas offered to donate their time and culinary expertise and give the proceeds to the farmers market and the adjacent all-local food store, Boone Street Market. The second year, attendance grew to 160; now it’s at 216. 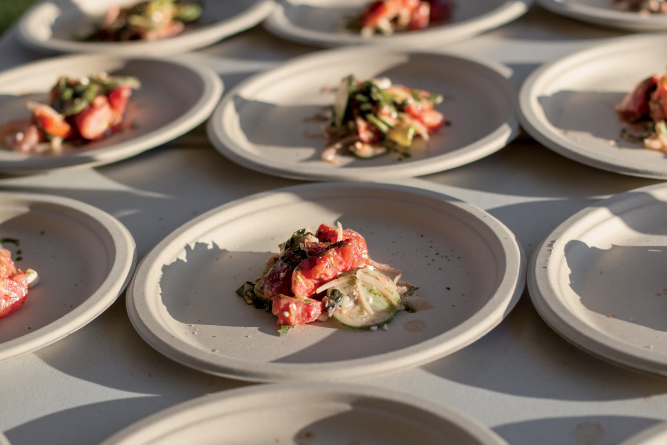 Tickets quickly sell out, and there’s a waiting list of potential guests bent on sampling dishes like smoked tomatoes with goat cheese mousse and summer greens, roasted corn relish and Sunburst trout, with all ingredients sourced straight from the farmers market. So far, the annual dinner has raised $52,000 to help pay for expenses not covered by vendor fees at the market and retail store and to buy ingredients for the community dinners from local farmers. (Organizers pay full price to boost the growers’ revenue.) Fifty volunteers offer their time. Any idea of the date for the 7th annual jonesborough farm to table dinner on main street? Hi Katalin, we’re not sure, but you can check with the folks in Jonesborough at http://jonesboroughfarmtotable.blogspot.com/p/tickets.html. Hope this helps!